We’d love your help. Let us know what’s wrong with this preview of The Financial Freedom Guarantee - A 10 step Property Buying System to replace your salary, fire your boss and never work again by Marco Robinson. YOU NEVER HAVE TO WORK AGAIN! in a world full of debt and servitude. helped thousands of his students do the same. with new tax laws, the buy-to-let property world is booming! 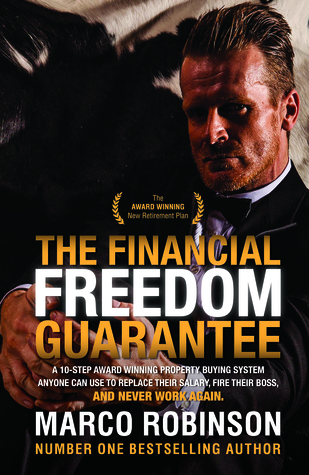 Published February 29th 2016 by Austin Macauley Publishers Ltd.
To ask other readers questions about The Financial Freedom Guarantee - A 10 step Property Buying System to replace your salary, fire your boss and never work again, please sign up. Though the author starts his book with lot of self-promotion, the overall impression this book leaves is very good. I would say his book is quite comprehensive, provides wealth of information and it is easy-to-go-through – therefore making content found inside not only useful, but easy and logical to follow. Though personally I'm not interested in t ‘The Financial Freedom Guarantee’ written by Marco Robinson is an extensive, well-presented and professionally written guide for property investment. Marco is a #1 Bestselling Author of two Books, an Award Winning Entrepreneur & Winner of the People’s Choice Best Real Estate Investment Company 2015 & recently as a Restaurateur Winner of the Tatler’s Best Restaurants 2015 for his NAKED Restaurant Concept. He has made countless National Radio and TV appearances and has spoken at the prestigious Napoleon Hill International Conference, the O Marco is a #1 Bestselling Author of two Books, an Award Winning Entrepreneur & Winner of the People’s Choice Best Real Estate Investment Company 2015 & recently as a Restaurateur Winner of the Tatler’s Best Restaurants 2015 for his NAKED Restaurant Concept. He has made countless National Radio and TV appearances and has spoken at the prestigious Napoleon Hill International Conference, the Ogilvy DO Debates, Bloomberg, and Forbes. He is in high demand on the speaking circuit and is invited to talk on various platforms around the globe with appearances in Print Newspapers, Magazines, TV talk shows and Prime Time TV slots. He is also the founder of the NAKED Group of Companies including the Award Winning Naked Restaurant & Bar (WINNING TATLER’S BEST RESTAURANTS 2015) recently opened in Kuala Lumpur, Malaysia, which has already spawned three new Franchise Companies, NAKED COFFEE; NAKED PIZZA & NAKED Beauty Bars, specialising in Revolutionary one of a kind Eyelash, Nail & Spray Tan Treatments, now OPENED in the UK. He has built several Multi-million Dollar companies from scratch such as the Wealth Revolution Group, Create Demand Incentive Programs, The Rich List, Naked Restaurants, as well as Wealth Creation (UK) Ltd, and has raised over $ 30 Million through a Brand New Award Winning Property Crowdfund. He develops & invests in Below Market Value Properties and shares the profits with his Investors. He personally owns over 200 properties and is now a Property Developer in his own right making him a Self-Made Millionaire many times over.